A single phase synchronous Reluctance Motor is basically the same as the single cage type induction motor. The stator of the motor has the main and auxiliary winding. The stator of the single phase reluctance and induction motor are same. The rotor of a reluctance motor is a squirrel cage with some rotor teeth removed in the certain places to provide the desired number of salient rotor poles. The figure below shows the 4 pole reluctance type synchronous motor. 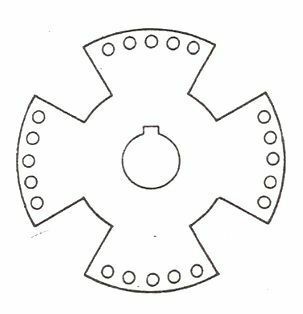 In the above figure the teeth have been removed in four locations to produce a 4 pole structure. The two end rings are short circuited. When the stator is connected to a single phase supply, the motor starts as a single phase induction motor. A centrifugal switch disconnects the auxiliary winding as soon as the speed of the motor reaches about 75% of the synchronous speed. The motor continues to speed up as a single phase motor with the main winding in operation. A reluctance motor torque is produced due to the tendency of the rotor to align itself in the minimum reluctance position, when the speed of the motor is close to the synchronous speed. Thus, the rotor pulls in synchronism. The load inertia should be within the limits, for proper effectiveness. At synchronism, the induction torque disappears, but the rotor remains in synchronism due to synchronous reluctance torque. The Torque Speed Characteristic of a single phase Reluctance Motor is shown below. The starting torque depends upon the rotor position. The value of the starting torque varies between 300 to 400 % of its full load torque. 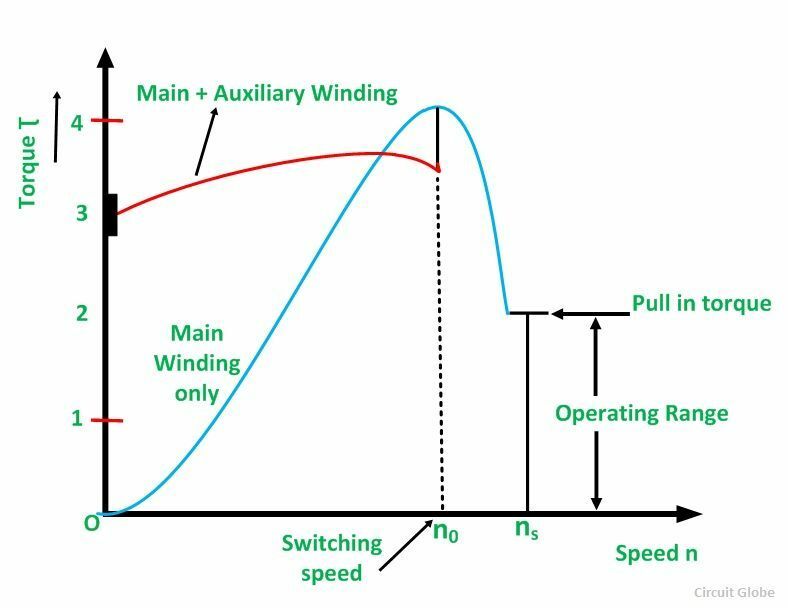 As we know that as motor attains speed nearly of synchronous speed the auxiliary winding is disconnected and the rotor continues to rotate at the synchronous speed. The motor operates at a constant speed up to a little over than 200% of its full load torque. If the loading of the motor is increased above the value of the pull out torque, the motor loose synchronism but continues to run as a single phase induction motor up to over 500% of its rated torque. At the starting the motor is subjected to Cogging. This can be reduced by skewing the rotor bars and by having the rotor slots not exact multiples of the number of poles. The rotor of a Reluctance Motor is unexcited, therefore, the power factor is low as compared to the induction motor. As the motor has no DC field excitation so the output of a reluctance motor is reduced. Hence, the size of the motor is large as compared to synchronous motor. Simple construction as there is no slip rings, no brushes and no DC field windings). It is used for many constant speed applications such as electric clock timer, signaling devices, recording instruments etc.